The MultiLogo Control Software makes it easy to get your logos on screen within a few minutes and our customers love it. It is used to control the MultiLogo logo keyers and the Clip N Key clip and sting stores. Perfect for setting up keying applications in advance, the MultiLogo Control Software runs on the graphics computer and allows easy board control and files conversion. 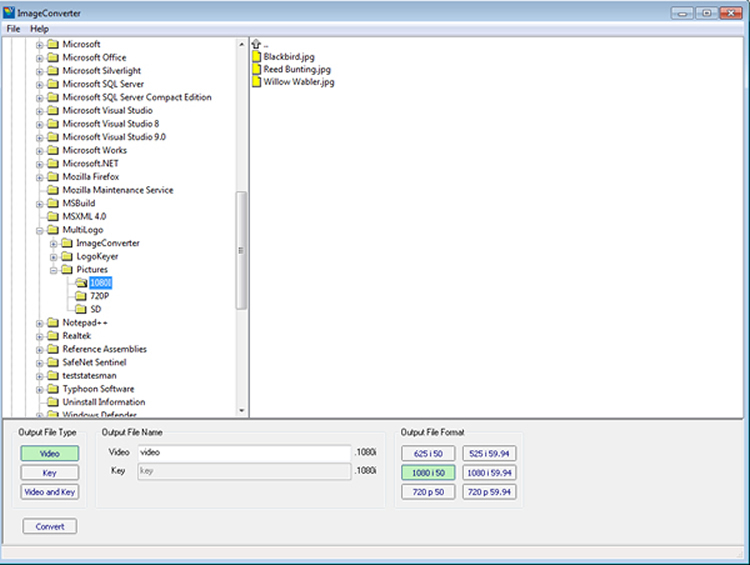 This free drag-and-drop software is included on a CD with all purchases of MultiLogo and Clip N Key. A simpler, cut-down version of the software is available for Clip N Key. Installing the MultiLogo Control Software automatically places a shortcut for both MultiLogo and Clip N Key on the computer desktop. This shortcut needs to be pointed at the board’s IP address in order to communicate with it. You can create multiple icons to control multiple boards, if required. You can easily upload still and moving images into the RAM storage. From within the Store tab, browse in the top left hand pane to the folder that contains the images you wish to upload. To upload the file, simply drag and drop it into the lower pane. File formats can be easily converted to MultiLogo's native file format using the included Image Converter program which can be used to extract the video, key, or both video and key from image sequences. During installation an Image Converter icon is placed on the computer desktop. The latest version of the MultiLogo Control Software is 1.72 which was released on 18th May 2015 to accompany the new V1.72 board software for the MultiLogo logo keyer. If you would like to upgrade to the latest version of the MultiLogo Control Software, please contact our support team.